I'm having trouble setting up a dual-boot (Ubuntu 12.04 LTS and Windows 8.1) in my ASUS K55VM laptop's hard drive disk (500 GB). I was mostly following tutorials for doing this, but at some point something has gone wrong. I formatted my HDD into GPT. An EFI System Partition (sda2). A Microsoft Reserved Partition (sda3). 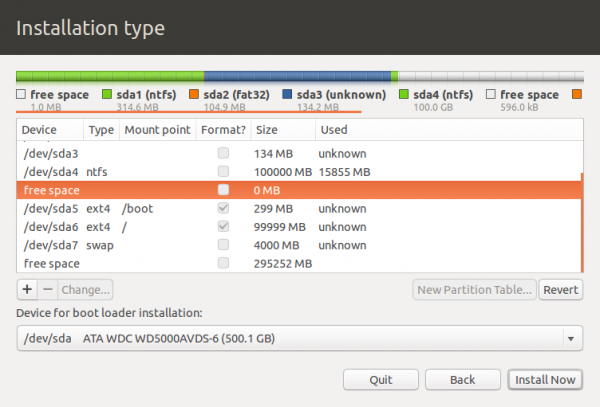 A Windows Data Partition or C drive (sda4). I reduced the Windows Data Partition via Windows' Disk Management. I made a bootable USB Stick with Ubuntu 12.04 LTS from ISO, using Universal USB Installer. A Boot partition, mounted at /boot (sda5). A Root partition, mounted at / (sda6). In Device for boot loader installation I chose: /dev/sda. Then, when I rebooted, it went straight into Ubuntu. So I installed Boot-Repair, and clicked on Recommended Repair. It automatically did its job without asking for anything. I executed this command: sudo grub-install --force /dev/sda5. Then I tried to make Windows 8.1's Boot Manager the main boot manager, so that I could choose which OS to boot into from a menu. I downloaded EasyBCD on Windows. It showed 2 Ubuntu entries and 1 Windows entry. I went into BCD Deployment tab and clicked on Write MBR. At this point, I went into BIOS and made Windows Boot Manager the first boot option. When I rebooted, I got a black screen with the message efidisk read error, and then (I guess) it switched to the next boot option, which is Ubuntu, resulting in Grub showing up. From Grub, Ubuntu entry is working and so are both Windows entries. If I choose Ubuntu, it normally boots into Ubuntu. But if I choose Windows, it goes into Windows' boot manager. If I choose Windows, it boots into Windows without any problem. If I choose Ubuntu, it boots into Grub (back to step 14). Windows Boot Manager is clearly not working as expected; I can't directly boot into it and I can't boot into it from BIOS either (efidisk read error again). If I want to boot into Windows I need to boot into Grub first, which is the opposite of what I wanted. I need help at this point. What is the best thing I can do? Is there a more reliable and/or simpler way of acomplishing a satisfying dual-boot for this situation? Can someone provide a way for going back to step 8, where I had a more efficient dual-boot setup? If only I could undo what I did with Easy BCD and skip Windows' Boot Menu... Can someone provide a way to fix this mess? Thanks in advance and sorry for the length of this, I wanted to be exhaustive. The last I heard, EasyBCD is useless for managing a dual-boot installation on an EFI-based computer. Thus, by installing it you just started digging a hole for yourself. You can recover your system from where you are now, but it might be simpler to start from scratch. To do so, follow your procedure through step #6; however, be sure that you boot the Linux installer itself in EFI mode. That should get you an EFI-mode installation of GRUB, which in theory should boot Windows without your having to run Boot Repair. If you have problems at this point, you can either run Boot Repair (which is klunky and often over-does things) or install my rEFInd boot manager. Do not install EasyBCD. At this point in time, your best method of dealing with problems is to read and understand the technology; automated tools get things right sometimes, but they also often mess things up worse than they were before. (This isn't really a criticism of the automated tools; unfortunately, there's so much variability from one EFI to the next that it's impossible for automated tools to get things right all of the time.) If possible, test a tool on a USB flash drive without installing it to your hard disk. You can do this with rEFInd, but it's difficult to do a test installation of GRUB to a USB flash drive. Boot-Repair ran the 'buggy' UEFI. It should have asked you and you should have said no, until confirmed that your UEFI/BIOS only boots from Windows not from an ubuntu entry. To undo & to rename files to their original names, you just need to tick the "Restore EFI backups" option of Boot-Repair. I think using EasyBCD just adds confusion with UEFI. You end up with too many boot managers. UEFI is a boot manager, grub is both a boot manager and a boot loader. Use UEFI or one time boot key or use grub. Currently with grub you need secure boot off as there is a bug with booting 8 from grub menu with secure boot on. Since with UEFI all systems install boot files into separate folders in the efi partition, there is not the issue of competing boot loaders all trying to use one MBR. And forcing grub into a PBR or partition boot sector makes grub less reliable and it may hve to be re-installed on grub updates as it has to use hard coded addresses for boot files or blocklists. Not the answer you're looking for? Browse other questions tagged dual-boot grub2 partitioning uefi gpt or ask your own question.